I purchased this vase @ a silent auction, it actually belonged to a top executive of Philip Morris Asia, and he was in China for 25 years before relocating to Rancho Santa Fe in La Jolla CA area. I know he had a Censer which was worth around 10-15k, and it was legitimate Xuande. So I'm hoping my vase is equally as legitimate. I bet an Chinese executive can easily buy a fake as can anyone. 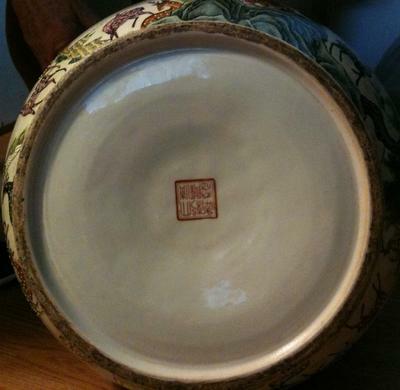 So, I'm just very curious if anyone recognizes the mark, period, and can give me detail about the vase. I know it is the Hundred Deer motif. I have seen 1 mark that matched exactly to this, but not sure if that means anything. Of all the marks I've viewed it mostly does not match up to any of them. I've not seen this mark on any actual items. I only saw it on a page that listed 6 marks from the Qianlong Period of 1736-1796. At bid there were quite a few Asian people that had showed up (which is unusual for this auction), and I also saw a limo, and a few high end cars show up. This is a very unique silent auction inside a thrift store. They receive donations, and buy some estates if the price is right. Seeing a higher end crowd here is unusual. One lady was very upset at having lost the bid on this item. She looked to be very distressed over the loss. So I'm curious, what is the importance, is it a true rarity, or maybe just her own perception of what it meant to her. Anyways, here is my pics. Your vase is amazing! I bought one too, so beautiful! Just send me your email, i ll post you the picture! :) It is a real diamond!!! I m French, i live in Paris. Our meeting was moved to the end of July I will update you on this. We have riots in that area so Im relieved not to be in Beverly Hills right now. Hoping chaos settles before we go out there. Any news about the Bonhams' appraisal of the vase? You said "if the vase is of the Qianlong period, the mark doesn't matter anymore." By that, do you mean an antique doesn't lose its value even if the mark is spurious? I have seen antique looking items with marks that look like those listed by Gotheborg as recent. Also, what about antique porcelain that have been decorated recently? How do these items are appraised? Accidentally, when I was browsing Qing Dynasty vases on line, I saw a lookalike hundred-deer-vase on Pinterest (antique dealer????) The said vase is supposed to be in Shanghai Museum. I am curious to know what is fake and what is real. Thanks. I'm eagerly waiting. I also bought a wood carved Burmese Monk. It's fairly large, but the base was left rough. I know this is out of place. So Im just curious if you know any sites were such conversation is reasonable? Glad to hear you decided to go to Bonhams. With them you might get a more reliable conclusion than with one of the smaller auction houses, or an average antique dealer or appraiser. But for imperial ware the mark is not quite right. The mark should be blue, hand-drawn and without a frame. This one looks like a stamp mark. The original type of this vase would be of a class which I could not know for sure if it is authentic or not. Most collectors are incapable to judge imperial wares for sure, as they almost never have the opportunity to inspect them. We can only see them behind glass. The opposite is also true, those researchers, etc. in museums, etc. who all the time handle such items, may often not be able to judge the more common wares. What I see in your pictures is a bottom and foot rim that does not correspond to what I know about those of period antiques. But, these are pictures after all. A hands-on inspection often may bring a different result, and it allows inspecting glaze, etc. with a magnifier. You should also be aware of a third possibility, namely that it is from the Qing dynasty, but made later with an apocryphal mark. If it were so easy to tell someone what the features of a bottom or foot rim are, and he/she could understand it, then we wouldn't have to learn for years what is genuine and what is fake. Knowing this is really one of the keys to separating the real thing from the rest, but it is in no way easy and requires experience in the specific field (item type and period). Your item seems to have good provenance, but collections do sometimes contain fakes, most likely because the collector did not have sufficient knowledge to authenticate all items himself. Especially with Chinese porcelain, which covers a time span of far over 1000 years it is impossible to know it all. Sometimes items may be in a collection because they were a gift, or other reason. I wish you good luck with the appraisal. Curious if the problem w/bottom is the ripply/unevenness? Trying to understand what distinguishes a fake. I did not take the pucs in well lit area, & out of habit allowed my editing program to auto fix lighting. In addition, under better lighting I was able to see a film of stuff. I wiped only a little and it came clean. I then took a picture to see if it still comes out uneven, & it's smooth. Also just looking at it and touching it, I could tell it was smooth. Other than that, what else would make it a fake in terms of the base? Also, the item, & a few more estate items that I purchased are originally the property of Duck Song who was president of Philip Morris Asia. It also has a sticker that is quite aged and faded, inside the mouth bit appears to be an old auction item # type sticker. Mr Song lived in Hong Kong 25 years, & owned several multi million dollar homes in the USA. I'm getting this appraised at Bonham's next week, along w/other items. I will let you know the outcome. However Im still curious about what makes the bottom current versus antique? I also tried finding replicas but have not found one of this type. Would love to find one for comparison. What is the best way to find a reputable dealer? I am in Yucaipa, CA which is part of the Inland Empire of CA. You cannot rely on a mark alone for authenticity (see "Marks" on the left). 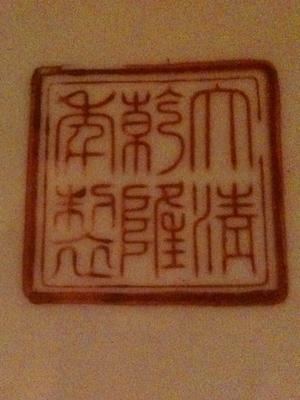 There is a Qianlong mark which resembles this one somewhat, but in my book it looks as if it were hand drawn, while this one looks more as if it were stamped, using slightly differently shaped characters. Anyway, you better had someone do a hands-on inspection to check the item itself. Lots of 20th century fakes have genuine looking marks. But, if the item is from the Qianlong period, then the mark does not matter that much. With this sort of item it can be difficult to judge via images only. Here is my updated picture. 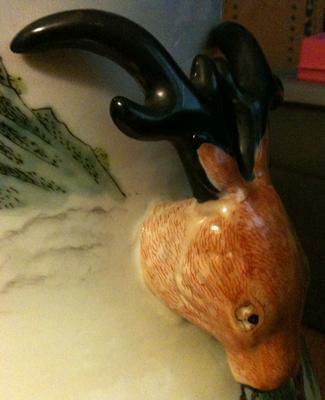 This is the bottom of the Deer vase. So I had the vase verbally appraised at Bonham's. It is a newer piece, but not recent. 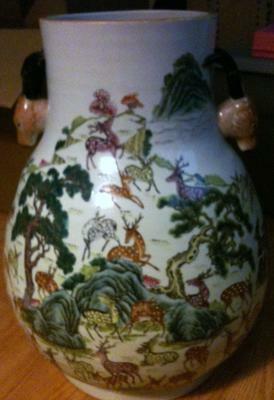 It is considered to be a 20th Century Antique Vase done in good taste. It a vase basically done to honor an earlier piece. As as I said, my plan was to sell. I am an eBayer w/top rated status (My customers appreciate my ethics), & I take pride in how I conduct my business. So I listed in a manner conducive to what I learned about the. The appraiser said I should not have trouble selling it, & gave me a starting bid of 1200-1500 for just the vase. I would have rather it be older, but it still has excellent value for its age & quality. I bid on it through a silent auction. I did very very well for its actual value. It should experience some decent bidding. Fingers crossed. Thanks for engaging me in this blog. I appreciate your knowledge and honest opinion. I'm afraid the bottom in this picture looks as if it was a recent product. Never saw such a bottom on an authentic antique before.